Our First Haiku Contest: Tea and Creativity! It often helps us, as we struggle to find time to do our creative projects, to have a little prompt, some gesture that tells us that it is now time to get serious, and sit down with our work. We tell ourselves, “After I finish reading the paper, or cleaning up after dinner, or eating lunch, I will go ______ (you fill in the blank – paint, or sort out my photographs, or edit some video, or write). For me, this is most often a cup of coffee or tea (you can see my earlier post on coffee and creativity here ). I wake up with coffee, and then switch to tea later in the day. 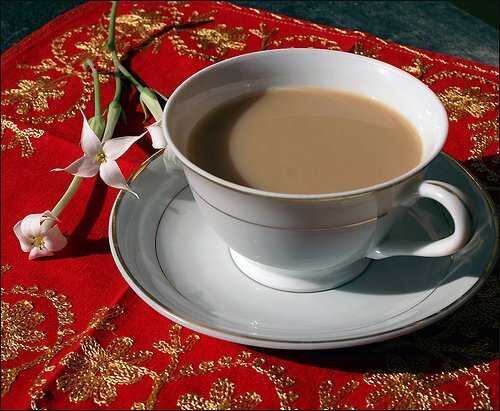 Coffee is my first burst of inspiration; tea sustains and comforts and helps me bring ideas to fruition. 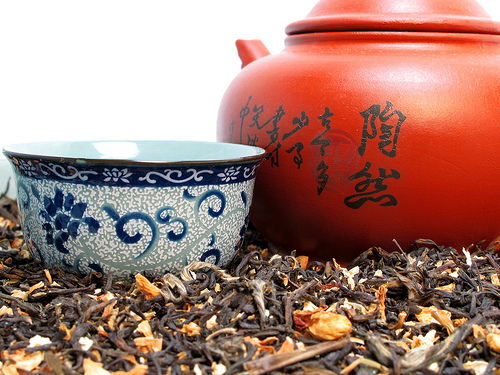 Tea, like wine, has its devoted connoisseurs, the people who will tell you that if you do not drink the white tea made from buds that bloom only for a week and a half every other year in some obscure province of China, you have not really experienced tea. Like Captain Jean Luc Picard, I enjoy a nice cup of Earl Grey, hot, when it is available, but honestly will settle for lesser brands, at any temperature, when it is not. It is the making of the tea, the ritual of heating the water, pouring it over a tea bag (or sachet or leaves, if we are being elegant), that creates the moment of peace, the little separate space, that allows you to launch yourself into the next hour of your day, the hour when you will have a little peace to do your creative work. As firm believers in the drinking of coffee and tea to support creative endeavors, and to help inaugurate what we are sure will be a wonderfully creative New Year, The Intuitive Edge invites you to participate in our first annual haiku contest with seventeen syllables on the subject of coffee or tea and creativity. Use your vivid imaginations – and we know enough of our readers to know that this is not in short supply. The traditional Haiku form used in English is 17 syllables (5-7-5), but this is the Intuitive Edge: give yourself a little room for creativity. Please post your entries here in the comments section. You will retain all rights to all seventeen syllables after they have first been posted here. Good luck, and we look forward to your entries! Why Are We All So Tired? Lately almost everyone I know has been telling me that they are very, very tired. Many of us, of course, have very good reason to be tired; we work all day, and then we try to write or play music or paint or blog or do photography at night and on weekends. This is the fabric of our lives; we are used to spending our days overwhelmed by the sheer volume of things we are trying to do. And everyone is just getting over some bug or another, and dragging themselves slowly into spring. But I feel what I’m hearing lately in people’s voices is something more than that. Although we’ve all been living for at least a decade now with a different sense of how unpredictable and frightening the world can be, the last few months may have threatened our precarious sense of balance in a new way. Earthquakes, tsunamis, nuclear disasters—we’re indirectly experiencing so many events completely out of our control that even the new and scarier world we’ve gotten a bit used to has been turned on its head. Many of us can’t bear to watch the news for more than a few minutes at a time, and when we do, we watch with a kind of fascinated horror, and perhaps it makes the things we are trying to do—find the right chord for a song, finish a portrait, rewrite a scene—seem kind of unimportant. Just getting up in the morning and paying attention to what is going on around the world is exhausting right now—how can we push ourselves to take one more step? I’m not sure I have the answer to that, except that there are all kinds of ways to bear witness to the world and the other human beings in it, and exercising your own creative spirit might be one of them. If it can only be five minutes of thinking about your project, or five minutes of sketching or writing or looking through a new lens, that is five minutes of sanity and calm that will move you closer to your larger goal. Once I heard a Zen teacher talking about how, if you can not find half an hour for meditation, you can surely find fifteen or ten or five—or two—and I believe the same holds true for creative endeavors. It may seem like a useless effort, it may seem like a tease, but really—is it going to make you any MORE tired to dedicate five minutes to shaping something new? Maybe not – maybe it will even have the opposite effect, and encourage you to try ten minutes tomorrow. Or maybe it will just have to be five minutes every day until the news is a little bit more bearable again and we can dream a little bigger. September is here, and it’s that time of year for many of us – time to send out proposals, time to submit our work to editors or galleries or agents or producers. I’ve been sending out my work for many years, and no matter how many positive responses I’ve received, it’s the negative ones that stick with me. The power of positive thinking seems to shrivel when confronted with my deep distaste for handing my work over to someone else to accept or reject. Despair describes the feeling I get on opening an envelope with yet another rejection slip pretty perfectly. But how can we combat it, that feeling that no one will ever be interested in the work that takes up all the waking minutes we might otherwise be more profitably spending on, say, actually making a profit? So that’s the story, folks. Maybe you can assign one otherwise depressing Monday night a month to gritting your teeth and shipping out your work. Maybe, if you’ve got a strong stomach, you can do it more often than that. But if it doesn’t become a habit, it won’t get done at all. And just think how wonderful you’ll feel the day following your 99th rejection when you get that email or note or phone call saying: you’re in! And now that you’ve made a habit, you won’t let that stop you either (unless of course this is your magnum opus, and its acceptance means your life work is done) on the next appointed Monday, when you will send your work out again. I then asked, “So what gets in the way?” He shared that it is partly his perfectionism and partly his pattern of getting easily distracted. He then reflected and added that the single most difficult obstacle was his life-long struggle with chronic depression that began in adolescence. He does not think people are creative when they are depressed. He gave Van Gogh as an example – he did not paint when he was depressed, but when he was in recovery, even while in an insane asylum. He does, however, feel there may be a link for those who suffer from manic depression, because some people claim they do their best work while in the manic phase. For the time being our conversation is on pause. I am very interested in trying to understand the relationship between the desire to be playful and the necessity of engaging in a discplined ritual if one wants to actually commit to writing (or any creative endeavor). Are you ever curious about how to become more creative? All we have to do is turn on Dr Oz’s TV show to learn how to become more physically fit or how to eat in a more healthful manner. We can change the station and watch Martha Stewart if we want to become better cooks. But to the best of my knowledge, there is not a TV show that will tell us how to become more creative. In Mihaly Csikszentmihalyi’s wonderful book entitled “Creativity” he talks about specific recommendations people can follow to increase their creative potential. I will share of few of his gems today. It can be as small as eating something different for lunch, maybe try adding mustard greens to your salad or as he suggests, paying closer attention to something you usually do. It could be as simple as listening differently to a conversation you are having with a colleague. Ask yourself WHAT IS THE ESSENCE ? Ask yourself how do you really feel about this person anyhow? Do you see them differently depending on your own moods? 2.Try to surprise at least one person a day He recommends saying something unexpected. Or expressing an opinion you would not ordinarily dare to reveal. He also suggests something as simple as experimenting with your appearance. Buy a scarf or if you are a scarf person, buy a color you would never imagine yourself wearing. Or risk shopping in a story you usually avoid. If you want, you can dare to log in to our blog and post a comment to share about what you have tried that is really new and different for you. Maybe what will be new is to blog at all! Many books for writers, the best known of which may be Julia Cameron’s The Artist’s Way, advocate that you wake up every morning and write. Attack your resistance before it takes hold. Retrieve the residue of your dreams, and manage a feeling of virtue all day. Write anything, they say – it doesn’t have to be immediately meaningful. Just write. All well and good, if you are a morning person. But some of us get out of bed with reluctance every day, and do not really become even mildly functional until as late as 4 PM. Some of us are averse by nature to “just writing,” and do not like to set pen to paper, or finger to keyboard, without a larger purpose. And some of us lead such intensely busy lives that that half hour or hour just isn’t available every morning – be it a demanding boss, hungry children, or a troop of chimpanzees we are studying, we just cannot commit that time. As Leslie mentioned last week in her post, this advice has generated a lot of guilt in a lot of writers and artists. Leslie and I are both strong believers in rituals for artists, but we also believe that you have to create your own. There are lots of books that tell you to do other things first thing on rising, with advice ranging from getting on your exercycle to drinking a glass of hot water with lemon – and while I am sure these are all fine things to do, you don’t HAVE to. Really. Lots of people go to the gym after work, not when they wake up, and they seem to be as healthy as anyone else, if not healthier than most. And you can do this with writing, too. Write after work. Write before you go to bed. Write while eating your tuna sandwich at lunch. Write while on hold with the cable company. (I have done all these things, and can speak to their efficacy.) Or better, do make an appointment with yourself to write regularly. Maybe it will be every Sunday morning, while the rest of the household sleeps. Maybe it will be Mondays, Wednesdays, and Fridays from 5 to 6 after everyone else has left the office. But don’t let anyone tell you that waking up at 6 AM and writing is essential to YOUR life as an artist, whatever kind of artist you may be. Some do – most don’t. Quite possibly all you want to do in the morning is drink your coffee and read the newspaper or a blog. When Leslie and I meet to work on our creativity book (in progress, stay tuned) or our blog, the first thing we do is order coffee. We’ve never discussed this, but it has become our ritual, born in the days when we began meeting at (appropriately enough) the Art Café on Broadway. We usually order a meal or snack with it, but until the coffee is in our cups, we don’t start tossing ideas back and forth. What is it about coffee? Or is it about coffee? Well, of course, it is in part about the coffee itself, which has the pleasing effect of sharpening our minds and waking us up, good preparation for creative work of any kind. But to tell you the truth, usually by the time we get together in early afternoon, we have both switched to decaf for the day, so the salutary effects of caffeine aren’t really part of the equation. What it is really about, I think, is the ritual. Since coffeehouses came into vogue several hundred years ago, people have been meeting over cups of coffee to talk. And it seems to me, that over most of my writing career, whenever anyone had anything important to discuss with me or any new collaboration was beginning, it was always over a cup of coffee or tea. In the first writer’s workshop I ever joined, back in Connecticut somewhere in the Mesozoic era, we depended on several pots of coffee to get us through the night, and although the caffeine consumption may now have declined several workshops later, the ritual holds firm. Rituals help us over that little hesitation most of us feel when beginning a new project or picking up the old ones after any kind of break. Many of us can’t sit down at our computers or at our easels without a cup of coffee or tea beside us; and you’d be hard put to find a day time rehearsal for any kind of ensemble that wasn’t fueled by Starbucks. We relax a little when we lift those cups to our lips; it’s the beginning of a chain of actions that we know (without having to think about it) will lead to us getting back into the flow of our work. If you haven’t got a ritual, you might try inventing one that suits you. It doesn’t have to be coffee. It might be a walk around the block, or listening to some music that sets you in the right direction. I know a painter who swears by Diet Coke and a writer who likes to pop a chocolate truffle. The form of the ritual doesn’t matter; but the consistency does. If you repeat the same small action every time you sit down to work, you’re giving yourself a handy creative cue, and making what comes next just a little bit easier.